Seven years ago there were outbreaks of xenophobic violence in various parts of South Africa, and this year we have seen more of them. There has been some discussion about the accuracy of the term “xenophobia” to describe this, but it seems quite accurate to me, though I agree that we should perhaps add xenomisia. Xenophobia and xenomisia taken together mean “the fear and loathing of foreigners”, and that fear and loathing undoubtedly exists in some circles. This morning I saw a comment on Facebook, apparently intended in all seriousness, that the part of the Freedom Charter that reads “South Africa belongs to all who live in it” should be amended to read, “South Africa belongs to South Africans”. South Africa is not the only country to experience xenophobia. It is found in most countries, and in some places it also leads to violence. See, for example, Neo-nazis are threatening an Orthodox community in Berlin / OrthoChristian.Com. In South Africa, the news media are generally against xenophobia, whereas in Australia and the UK the news media sometimes actively promote xenophobia by using terms like “suspected asylum seekers”, thus implying that seeking asylum is a criminal activity rather than a human right. 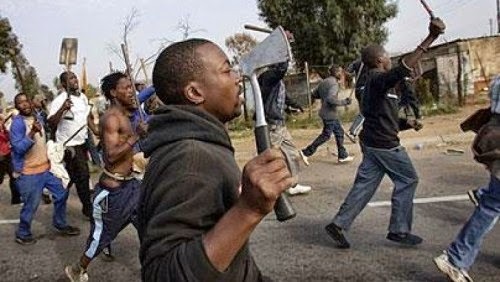 Quite a lot has been written about the causes of xenophobic violence, though usually in terms of rather vague and abstract things like unemployment, poverty, or capitalism. This may be true, but it would be useful to have more specific studies of what prompted particular attacks. 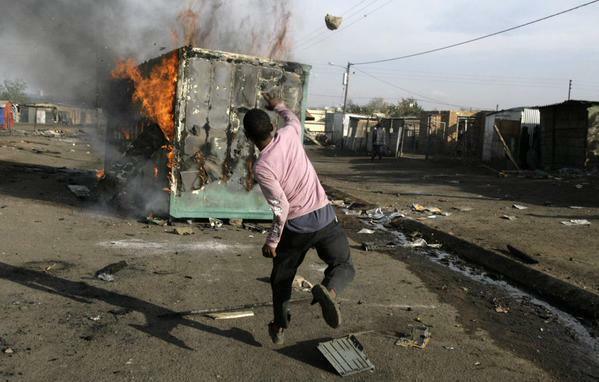 In February 2008, for example, there were xenophobic attacks in Mamelodi in the City of Tshwane. These were not much noticed by the media, because they did not take place in Johannesburg. There was anecdotal evidence that the attacks were instigated by businessmen seeking to get rid of rivals who happened to be foreigners. A few weeks later there were similar attacks in Atteridgebille, and especially in the informal settlement of Brazzaville, on the other side of town. Some claimed to have seen combi-loads of people being brought in from Mamelodi who instigated the violence, in which some local people then joined. If these riots were started by businessmen seeking to get rid of rivals, then the cause could be said to be “capitalism”, but capitalism working in a particular way, and it is that way that needs to be examined more closely. Perhaps such research has been done, but if it has, I would be interested in knowing the results — how many incidents of xenophobic violence were sparked off by this, how many by that? Other anecdotal explanations have been that someone was shortchanged in a shop run by a foreigner, an argument ensued, and it escalated from there. Or some crime takes place, and the perpetrators are heard speaking a foreign language. There is a hue and cry against “foreign criminals”, but how do you distinguish between criminals an non-criminals in such circumstances? And I don’t think hashtags or bumper stickers saying “Say No To Xenophobia” will do much to prevent it. The violence strikes at what is at the heart of post-apartheid South African identity. For all the talk of hospitality and “ubuntu,” xenophobic violence is a reflection of how the ruling ANC and most South Africans understand the boundaries of “South African-ness.” As commentator Sisonke Msimang suggests, what binds black and white South Africans together is a kinship based on their shared experience of colonialism and apartheid. I discovered that for myself when I went to study overrseas in 1966 at the height of the apartheid era. I met a black South African friend who had arrived a few weeks after me, and we compared notes about our culture shock on arriving in Britain, which were very similar, and we both found it hard to get used to not having to look up when entering a post office or railway station or other public building to make sure that we were using the ethnically-correct entrance. But a shared sense of South-Africanness does not necessarily lead to xenophobia and xenomisia, nor does it necessarily lead to violence, though it does lead to prejudice, which I am sometimes shocked to find in myself. I’m introduced to a Nigerian and the thought “drug dealer” surfaces. I’m introducted to a Bulgarian and the thought “car thief” surfaces. My rational mind intervenes and says “Don’t prejudge people by their nationality. You know it’s stupid.” But the thought is there, and comes, unbidden. But if we are looking for the big abstract causes of xenophobia, then I think one that stands out is the failure of transformation. There’s a lot of talk of transformation, but little has actually changed. And when I speak of transformation I’m not talking about cosmetic changes like defacing or removing statues. Zimbabweans are a lot better educated than many South Africans, and as a result they tend to get better jobs. Because they are better educated, they often make better teachers, and we ought to welcome them with open arms, because they might be able to help us to transform education. Why are Zimbabweans (and Congolese) better educated? Because they never had Bantu Education, and the theory of Christian National Education, and the theory of Fundamental Pedagogics that underlay that. In 1946, Todd won the Shabani seat for the United Rhodesia Party, the most liberal of the groupings in the field. After rising through three ministerial postings, in 1953 he became prime minister and party president. He proceeded to introduce various progressive measures, including, in 1955, a five-year plan to give elementary education to every African of school age. It seems that he left a legacy that not even Smith or Mugabe could destroy. The other place where there ought to have been more transformation is policing. We complain about xenophobia but we now see the police harassing foreigners as if they were conducting a 1950s pass raid. And with armed mobs beating up foreigners, with comparatively few arrests, perhaps the xenophobic gangs get the idea that the police are conniving at what they do. And then the police do the same to South Africans at Marikana. ← What do web designers have against the visually impaired? Under Ian Smith education was available to all at the primary level. The “terrorists” stopped education in the areas they controlled. This was short sighted but consistent with Maoist practices. It is popular to denegrate Ian Smith in many circles but the propaganda against him was worse than the reality. With Mugabe it is the other way around. the term ‘xenomisia’ is new to me, but welcome since ‘xenophobia’ appears so inadequate. In my own reading I came across the old English ‘misoxeny.’ Any takers?